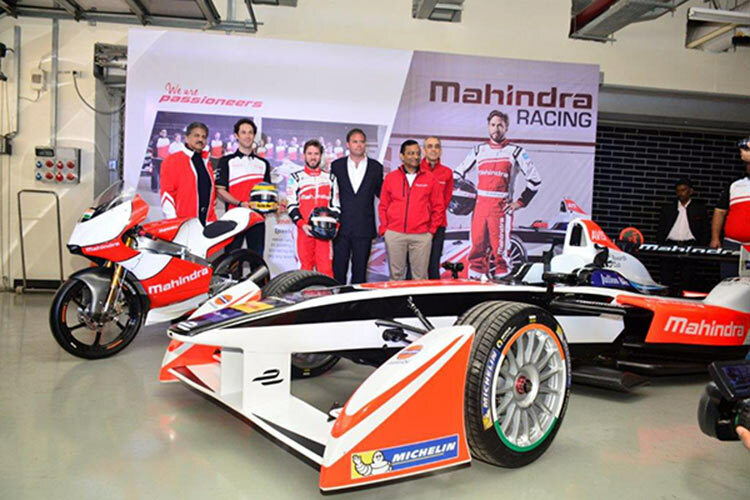 Mahindra Racing demonstrated the incredible power and performance of its new M2Electro Formula E electric racing car, and new MGP30 racing motorcycle at the Buddh International Circuit today. These racing machines embody Mahindra’s growing technical expertise and increased commitment to racing which is helping to build recognition and admiration for the Mahindra brand globally. Both the M2Electro and MGP30 compete at the very highest level of international motorsport in the Formula E electric racing car championship, and MotoGP world motorcycle racing championship respectively. The M2Electro was developed by Mahindra Racing to compete in the second season of the Formula E championship. This made Mahindra one of a select few manufacturers that developed an all new electric powertrain for the racing series. The second generation Mahindra Racing car, the M2Electro is blisteringly fast with a 0-100kms time of under 3 seconds. It has been designed with a priority on increased performance, energy efficiency and weight saving. Developed to Mahindra specification with world leading manufacturers including McLaren and Hewland, the M2Electro showcases the technology that you will soon find in your next electric road car. Mahindra’s is taking these learnings and technical progress made on the race-track are transferred into the development of a new generation of electric road cars. These road also demonstrate Mahindra’s vision of the ‘Future of Mobility’ with vehicles that are Clean, Clever, Convenient, Cost Effective and Connected. Formula E cars represent the future of electric car technology with racing taking place on city streets on all-weather treaded tyres similar to the tyres on your road car. The narrow, bumpy street tracks are a demanding test ground for any racing car and the M2Electro has excelled with no mechanical failures in its first few races in season two of Formula E. Early tests reveal that the M2Electro has proven a fast and reliable racing car, completing all allocated pre-season test days, successfully covering over 2,000km on track before official pre-season testing even began. Piloted by former Formula 1 stars Bruno Senna and Nick Heidfeld, the M2Electro has impressed in its first races by scoring the team’s maiden podium on its first outing in Beijing in a highly competitive field. Each driver races two Formula E cars during a race. During a mandatory pit stop about half way through the race, the driver pulls into the garage and swaps to a second car within a specified time. This in itself is a precise exercise and can be the difference between failure and glory. New engine, gearbox and aerodynamic packages are matched by several refinements to the chassis and electrical components. All these changes combine to offer greater performance in tune with a new double exhaust system developed by Arrow. The new Mahindra MGP3O will be campaigned by factory entry Team Aspar with retained talented young riders Pecco Bagnaia (19, ITA) and Jorge Martin (18, SPA). Three Mahindra customer teams will see six further MGP3O machines on the grid run by Team CIP, the Outox Reset Drink Team, and MTA Team Italia, all running two-rider outfits. New to the Mahindra family in MotoGP is Peugeot Motocycles factory team, SP Racing. An impressive line-up of Frenchman Alexis Masbou (28) and Briton John McPhee (21) will contest the Moto3 World Championship on an MGP3O-derived Peugeot.